This OFW uses the skills and experience he acquired overseas to put up and manage his own rice retailing business. He aims to help others get into entrepreneurship, as well, by offering the venture for franchising. <>Ramilton James Alenton worked in a major retailer in the Cayman Islands (Caribbean) for six years. Within that time span, he occupied five important positions, one after the other. He was a purchaser, head cashier, warehouse supervisor, POS supervisor, and sales and marketing supervisor. As an overseas Filipino worker (OFW), Alenton was already determined to someday put up his own business. When he came home for good, after saving enough money as capital for a venture, he immediately conceptualized a startup business. That was when BigasanKo.com was born. Within just three years since its establishment, the rice wholesaling and retailing business has already put up 53 stores, mostly franchised shops, nationwide. More outlets are scheduled to open in the coming months. Alenton has always been confident about his business. “When I started the concept, I knew that rice is the best product to sell in a predominantly rice-eating market,” he said. “I have made a system that makes it easier to sell rice in retail. 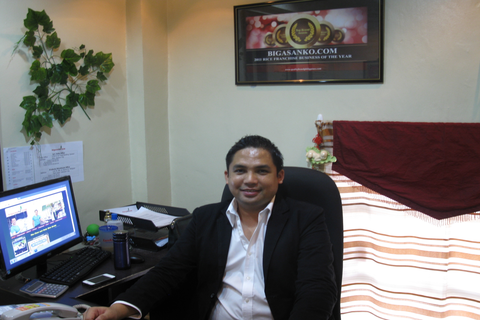 Thus, BigasanKo.com is ideal not just for retailing but also for wholesaling,” the 37-year-old entrepreneur added. The franchise is offered in various packages (P250,000; P550,000; P750,000; P2.5 million; and P10 million). The cheapest package is actually a kiosk. It includes the small store, signage, a small rice dispenser, and a digital weighing scale. The standard franchise package has these inclusions: store, signage, tarpaulin, marketing collateral, unique commercial rice dispensers (patented), digital weighing scale, and P40,000 worth of initial inventory of rice. For packages with fees ranging from P750,000 and up, store owners will access a special system that would enable them to offer other services to customers. Such BigasanKo.com locations can also serve as prepaid loading stations, bills payment centers, Western Union outlets, airline ticketing agencies, and processing sites of specified National Statistics Office (NSO) and passport renewal transactions. As a former OFW, Alenton knows how hard it is to earn money overseas. That is why he advises all OFWs to start saving for seed money. For him, it is advisable if they can start putting up a lucrative business while they are still working abroad. BigasanKo.com does not require a franchisee to personally manage the business. But if possible, the company prefers if his/her spouse or immediate relative can take care of the franchised store to make sure it will never be mismanaged. Alenton revealed that as a franchisor, it is his firm's responsibility to train and guide the store owners/managers to make sure they would generate profits. Each franchise package has a three-year term. Alenton revealed that they even offer an RTO (rent-to-own) scheme for franchise package worth P550,000. Interested franchisees can opt to try out the business for a year. “After that, they can decide to continue or pull out from the venture.” Franchisees can also opt to take staggered payment schemes for greater flexibility. This franchising opportunity is for every entrepreneur, whether you are an OFW or not. Consider the potential of rice retailing as a business. Check out the online directory listing of BigasanKo.com here.